This section, noted by its big curves, is located near the Antietam National Battlefield. Antietam was the site of the Civil War's bloodiest battle. The auto tour route through the battlefield also provides an excellent side trip for cyclists. 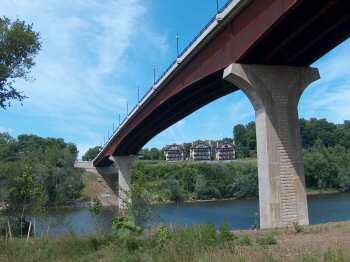 At mile 72.8, the towpath crosses under the Route 34 bridge. You can use this crossing to reach Shepherdstown, West Virginia which is located just across the river. (NOTE - June 2006: Bridge undergoing complete reconstruction, but nearly complete!) While on the bridge, you can't help to notice the charming Bavarian Inn, which sits on a cliff overlooking the river (Expensive, but recommended!). This town is the home of Shepherd University, and thus has several restaurant and lodging options. One popular restaurant is The Old Pharmacy Cafe & Soda Fountain, located at the bottom of E. German Street. In January 2000, the town was briefly in the international spotlight when it hosted the Israeli-Syrian negotiations. A side trip to the Antietam National Battlefield is recommended. I think the easiest way to reach town is by using Snyder's Landing Road (Milepost 76.6). Bowie Rd to Mondell Rd (at Taylor's Landing - Milepost 81) also works well, but it can be tricky finding the correct turns (note the railroad on the map - use that to help keep your bearings). Whichever route you choose, expect to climb some pretty good hills! Other than the big curves, there is not very much of interest along the towpath. The Killiansburg Cave, located about 50 feet above the towpath at mile 75.7, provided shelter to the town folks during the Antietam Battle. The foliage is fairly heavy in this section which makes it seem quite remote, however it also makes this section quite cool in the summer. Despite the remote feel, access points are fairly common. Take I-270 North to Frederick. At Frederick, follow I-70 West toward Hagerstown. At Exit 29, take Route 65 South toward Sharpsburg. Soon after passing the battlefield visitor center, make a right onto Route 34 (Sharpsburg's Main Street). From Sharpsburg's Main Street, make a left onto Mechanic Street. This becomes Harper's Ferry Road. After about 3 miles, make a right onto Canal Road (before crossing the stone bridge). The towpath and campground is located about a quarter mile down the road. After about 1 miles, make a right onto Millers Sawmill Road. The towpath and campground is located about 1.5 miles down the road. From Sharpsburg, follow Route 34 (Main Steet) through town. After about 3 miles, you will see the Potomac River bridge ahead. The NEW parking area is located at the bottom of the hill, about ¼ mile downstream of the bridge (just past the railroad threstle). From Sharpsburg's Main Street, make a right onto N Potomac Street. This becomes Synder's Landing Road. The towpath is located about 1.5 miles down the road. Taylor's Landing Road is a right turn from Route 65, about a mile before the battlefield. 69.3 Antietam Aqueduct The forth of 11 stone aqueducts constructed. Crosses Antietam Creek, which flows through the famous battlefield. 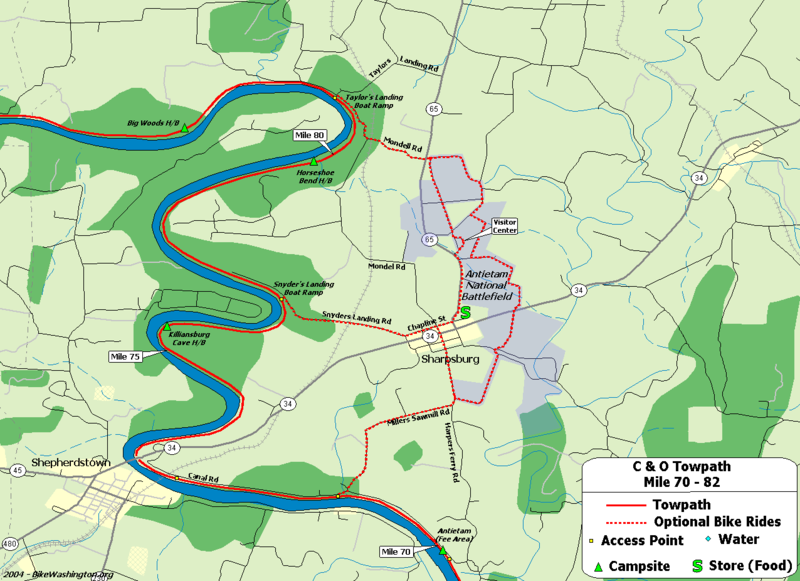 76.8 Antietam National Battlefield (map) 301.432.5124: Location of the bloodiest one-day battle in US history. On Sept 17, 1862, nearly 23,000 solders were killed at this location. The auto tour route also makes a nice bicycle tour.